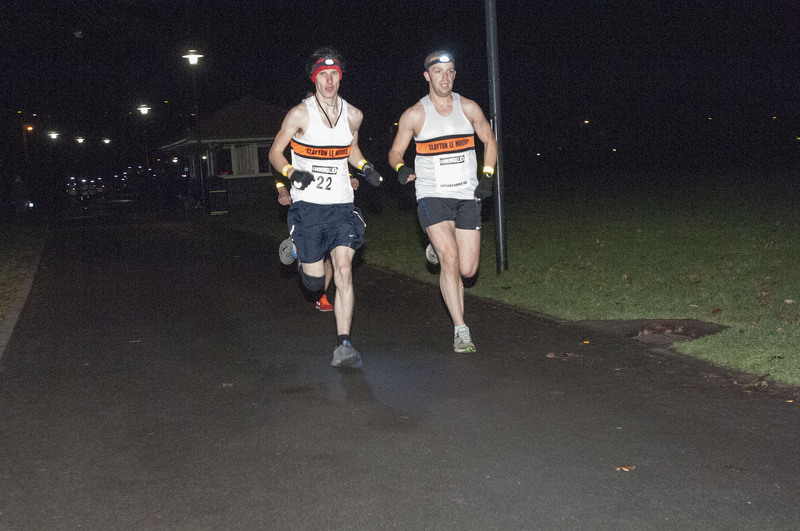 It’s great to see that the Winter chill isn’t putting the hardy souls of Lancashire/Yorkshire off racing in the Midweek 5k series around Todmorden Park! When we came up with the concept of a mini series of races we could never have envisaged what would be born. We are so thrilled to see such a community forming with runners of all ages & abilities turning up to pit themselves against the fast course at Todmorden, and it is also great to hear that so many are achieving season best times & even PB’s! Of course we need to report on happenings at the business end of the races with some cracking times – 3 runners have gone under 17 minutes which is some going on cold winters nights by headtorch, and of course we are proud to have Clayton-le-moors Harriers wheelchair athlete Anthony Gotts turning up to race also. We are now at the halfway stage of this years series but it’s not too late to get yourself along and take part. There are still loads of prizes up for grabs and you could even sneak in at the final hurdle to claim one of the improver prizes for most improved time over the series! So Far we have seen back to back team wins for the Clayton men, can they make it a hat-trick this week? There have been 15 different clubs as well as lot’s of unattached runners. There have been juniors U18 & seniors over 65 compete with a good mix of both male & female runners. Race 3 in the series is this Wednesday night 11/12/13 with a 7pm Cannonball Start! Registration will be in the Hare & Hounds Pub accross the Road from the park from 5:30pm.